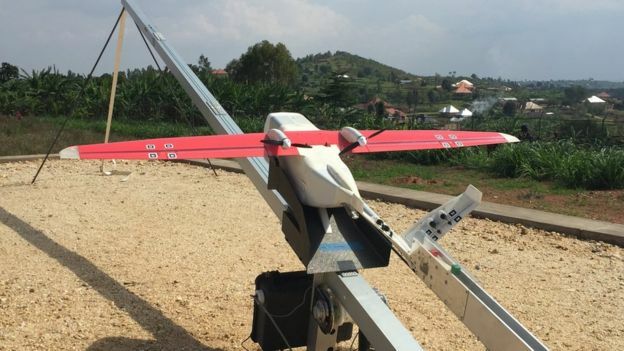 What is being hailed as the world’s first commercial regular drone delivery service is beginning drop-offs in Rwanda. They release small packages attached to parachutes without needing to land at the delivery points before returning. The technology promises to make deliveries much faster than had previously been possible by road. Zipline – the US start-up running the project – is made up of engineers who formerly worked at Space X, Google, Lockheed Martin and other tech companies. They have an operational range of 150km (93 miles) but could, in theory, fly almost twice that distance. 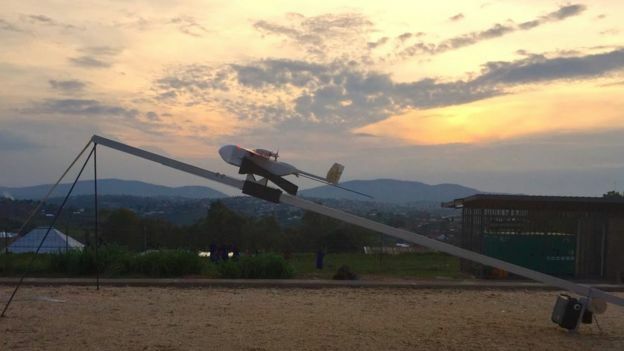 The drones are powered by a nose-mounted battery and guide themselves using GPS location data. They send back information to both their base and to Rwandan air traffic control via a cellular connection. To begin with, 15 “zips” will fly round the clock and in up to 30km/h (19mph) winds and light rain if necessary. Zipline will be paid by Rwanda’s health department on a per delivery basis. The company says the cost per trip is roughly equal to that of the current delivery method, by motorbike or ambulance. 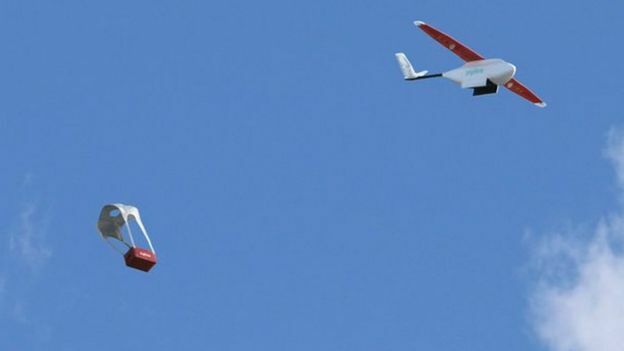 A wide variety of companies – including Amazon, DHL and Singapore Post – have demonstrated drone deliveries elsewhere that use aircraft that can touch down at both ends of their journey. But one expert praised Zipline’s stay-in-the-air approach. “This avoids the risk of recipients getting in the way of rotating blades,” said Dr Ravi Vaidyanathan, from Imperial College London. 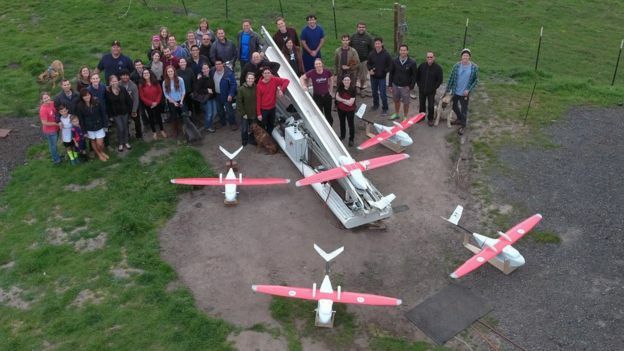 Drones have already been used for humanitarian purposes elsewhere in Africa, including in a now-ended project to deliver blood and stool samples in Madagascar, and a Red Cross initiative to monitor a refugee camp in Uganda. But some aid workers have expressed concern that they are not always appropriate. 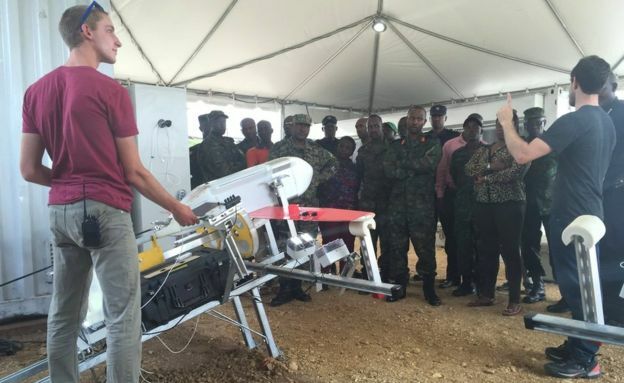 “Whether we like it or not, UAVs [unmanned aerial vehicles] are confused with weaponised drones and are perceived by the general public as related to military operations and/or intelligence gathering,” one Congo-based worker told a studycarried out by a Swiss foundation.